He said on Saturday in Akure that 36 cases have also been confirmed. In a Akeredolu a state broadcast, he said a total of 102 suspected cases of Lassa fever were reported in eight local government areas of the state. “Thirty six of 79 cases have been confirmed with laboratory results, including nine deaths. “Patients are being managed at the Federal Medical Centre, Owo, while confirmatory tests are done at Irrua Specialist Teaching Hospital, Irrua, Edo State. “At present, 127 hospital contacts and 308 community contacts were line-listed in all the affected local government areas while 30 had completed their follow-up,” Akeredolu said. The governor disclosed that he had reactivated Emergency Preparedness and Response Team at both state and local government level to contain the spread of the disease. He said this was in addition to active surveillance and contact tracing in the affected local government areas. “Sensitization and community mobilization are also going on in all local government areas for traditional rulers, religious leaders, political leaders, market women and other stakeholders. “Publicity is also ongoing through radio jingles, radio and television discussions in our media houses while educative materials such as handbills, flyers and posters have been produced and being distributed,” he said. According to him, vehicles have been dedicated for transportation of samples and referred patients to Irrua Specialist Teaching Hospital, Irrua in Edo State,. He added that the Infectious Disease Isolation Unit at the Federal Medical Centre, Owo, had also been expanded. 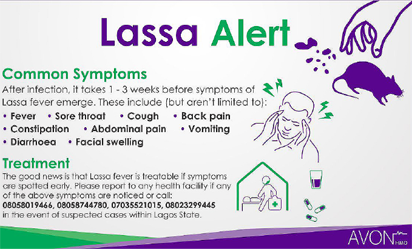 The post Lassa fever ravages Ondo, kills 9 appeared first on Vanguard News.